Kane Realty Corp. President Mike Smith in his annual report to North Hill’s tenants, partners and neighbors disclosed new plans for a high-rise apartment building that could be underway as soon as this summer. Sketches for the proposed 100 Plaza building show a 15-story, mixed-use building that would have about 35,000 square feet of street-level retail with 285 apartment units in two tiers at both mid-rise and high-rise levels. 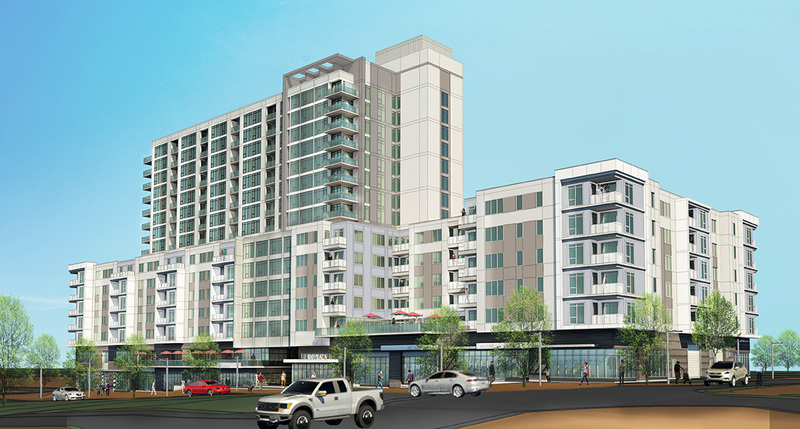 The 100 Plaza project would be built along the south side of the new Midtown Park and amphitheater, adjacent to the Hyatt House hotel, according to the plans. Kane Realty CEO John Kane confirms that the 100 Plaza building will be targeting apartment units renters rather than condo units for buyers, but he says no firm plans for the project have been finalized and that they are still seeking capital partners for the project. Construction plans, though, for the new 104 Dartmouth apartment building at the corner of Dartmouth Road and St. Albans Drive are on track, he says, to break ground in March. The revised plan for 104 Dartmouth show that it is now slated to have 171 apartment units once complete. North Hills currently has an inventory of 1,354 apartment units in four apartment communities, including Park & Market, Midtown Green, Alexan at North Hills and the Allister at North Hills. Next to the 104 Dartmouth building, Kane is partnering with Concord Hospitality Enterprises to build the new AC Hotel that was announced earlier in January.